Obesity is a bigger challenge for Large Breeds- Extra weight puts extra stress on a large frame, so it’s important for your dog to feel satiated without consuming excess calories. With moderate fat, this recipe helps control energy intake allowing your dog to eat enough and still maintain a healthy weight every day. Small Digestive Tracts Relative to Body Size- It is important for large breeds to easily digest and process food. We include live, naturally-occurring microorganisms to support digestive health and we ensure optimal nutrient absorption through our Digestool®confirmation studies – less nutrients in the stool, means more nutrients in the body. Higher Percentage of Muscle Mass- With greater size, there is more muscle to support and keep strong so we use 13% more protein than our Wellness Complete Health Adult Recipes. Keeps Joints Healthy- Carrying an average weight of 45kg is hard work. To help keep joints healthy, this recipe features our Wellflex® system – 750 mg/kg of glucosamine hydrochloride and 250 mg/kg of chondroitin sulfate. 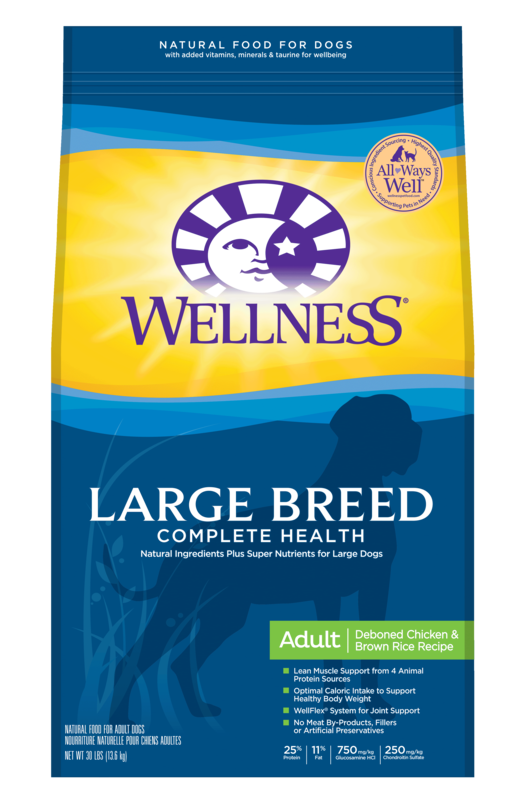 Large Breeds Tend to Eat Too Fast- This bigger, rounder kibble is designed to promote proper chewing time in larger mouths. We also guarantee your dog will love the taste of each healthy, flavorful bite. Dogs over 180 lbs: Add ¼ cup per additional 10 lbs. 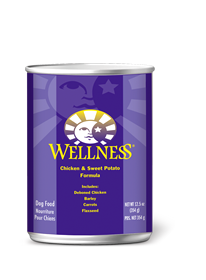 Combination Feeding: If feeding with wet food, reduce dry amount by 1/3 cup for every 6 oz of wet food. Calorie Content: This food contains 3,360 kcal/kg or 336 kcal/cup ME (metabolizable energy) on an as fed basis (calculated). 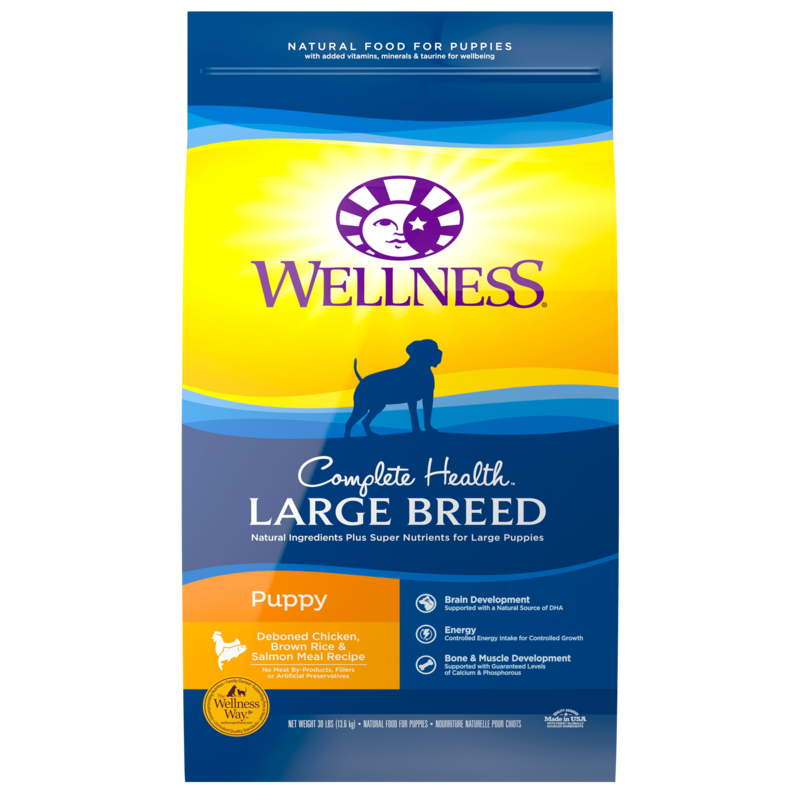 Wellness® Large Breed Complete Health Adult Deboned Chicken & Brown Rice Recipe is formulated to meet the nutritional levels established by the Association of American Feed Control Officials (AAFCO) Dog Food Nutrient Profiles for maintenance.